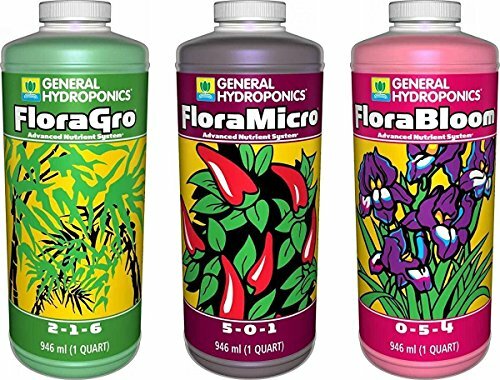 In today’s review, we are going to break down the advantages of using two different brands of liquid fertilizers that have become quite popular in hydroponics – Fox Farm Vs General Hydroponics. Liquid fertilizers are definitely one of the easier ways to get good results with your hydroponics system minus the extra effort of actually measuring out different plant nutrients. The old model for hydroponics was to buy nutrients individually and create a balanced ratio for general plant health. If you are an agricultural engineer or someone who is really into figures, this should not be a problem. But what about the rest of us? For the rest of us, liquid fertilizers come to the rescue. Liquid fertilizers are pre-measured, easy to add to hydroponics systems, and almost always guarantee excellent results. 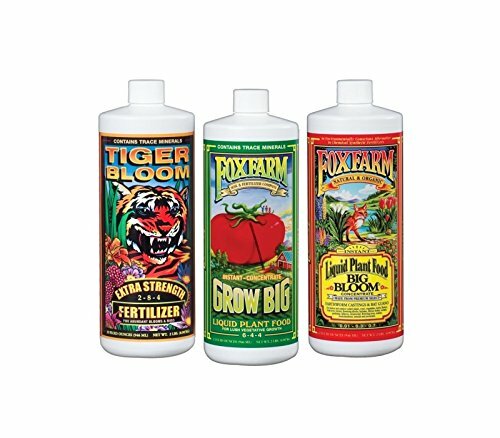 The Fox Farm Liquid Nutrient Soil Formula is a three-part system designed to help hydroponics growers create better yields while keeping the application process as simple as possible. The system is composed of three products: Big Bloom, Grow Big, and Tiger Bloom. Each one is technically full of plant nutrients, but they are designed for different phases of growth of your plants. What we especially liked about the Fox Farm system is they have an actual schedule that you can just follow, based on the week, and even the PPC and EC of the water. There is also an option to use other Fox Farm products and the balances and ratios are all in the same schedule, making it easier for the farmer to feed his plants. Based on the amounts in the feeding schedule, you will be consuming more Big Bloom and Grow Big Hydro, while Tiger Bloom will be used moderately five weeks into the main growing season. According to the manufacturer, Grow Big is the main driver of the trio and will help your plants grow lush and more compact. By compact, we are referring to study plant structures with lots of leaf volume, fruit volume (if any) and of course, healthy roots, stems, and leaves. Grow Big is used early in the growing season as this is the time when your plants need extra nutrient protection and boosting so they do not become stunted or die out. The formula has special organic nutrients from Norwegian kelp and castings (solid waste) from earthworms, making the nutrient combo a truly potent one. Tiger Bloom, which is applied five weeks onward in the growing season, is a fast acting formulation that is high in phosphorous and with adequate levels of nitrogen, too. Tiger Bloom helps plants attain wonderfully vigorous growth during the flowering stage of the plant. This part of the trio must be applied when the plants are showing signs of flowering. And finally, we have Big Bloom. Big Bloom is micro-brewed and has guano (bat feces) and castings (from earthworms). These high-grade and high-index sources of organic nutrients are perfect for growing plants in both soil and water-fed systems. Flowers grown with Big Bloom will have larger and sturdier flowers, higher rate of production of essential oils, and best of all, more fragrant flowers, too! General Hydroponics Micro Combo Set is a bestseller, and an equal contender to the Fox Farm liquid trio. This product system features a “building blocks approach” to feeding plants in a hydroponics system, making them more robust, lusher, and ensuring a better harvest at the end of the growing season. The General Hydroponics Micro Combo set encourages users to adjust the use of the system to suit the specific plant type in the hydroponics system. This is great because as a hydroponics grower you would not want to be stifled by a feeding schedule that is too strict, because plants (like animals) change over time, and factors like pH levels and EC all affect the nutrient uptake of plants. We like the fact that you can experiment with the solutions in the set to get optimum growth throughout the growing season. The General Hydroponics Flora Series is the latest innovation in soil-less nutrition from this brand and features three inter-related nutrient solutions for a thriving hydroponics setup. The trio is comprised of complete and highly absorbable primary and secondary nutrients, with a focus on improving crop quality and making the hydroponic system sustainable. The solution has highly soluble ingredients for maximum uptake of nutrients and has been pH balanced to ensure that your setup is fully balanced, too. Researchers from NASA use the Flora Series because it is highly effective and can function even in really cold temperatures. FloraGro is the first in the series, and encourage vegetative growth of the plants. This is the critical time of the growing season when the roots, stems, and leaves are only beginning to establish the primary framework for later in the season. FloraBloom is responsible for improving flowering and also increasing the production of essential oils. Florabloom also helps improve the overall flavor and taste of the crop. And finally, you have FloraMicro. FloraMicro is considered the foundation of the trio and provides the most important nutrients for plants. This solution contains high amounts of nitrogen, potassium, calcium and other important trace elements for balanced growth and better resistance to diseases. Both the Fox Farm trio and General Hydroponics trio provide adequate sustenance for plants in hydroponics systems. Both are pH balanced and highly regarded by growers everywhere.